A dinner ticket for the fundraiser for the proposed Blanchester Pool & Recreation Center. BLANCHESTER — The first community fundraiser for a proposed Blanchester Pool & Recreation Center will give attendees a chance to learn about the big endeavor and win cash prizes, too. The event will be held on Friday, Nov. 9 with a dinner lasting from 6 to 7 p.m., and a drawing happening at 7 p.m. at Blanchester High School, 953 Cherry St.
Dinner will be provided by Roadhouse BBQ, with desserts by Treasured Confections. This is the first public fundraiser to help the project, with the board continuing to seek private donations and sponsorships. Cash prizes will be awarded during the event, including a grand prize of $5,000. The first and every 10th ticket drawn will win $100; the 296th ticket will win $250; the 297th ticket will win $500; the 298th ticket $750; the 299th ticket $1,000; and the 300th ticket will win the grand prize. Tickets are $100, and only 300 will be available for the event. If interested, they should be ordered before Friday, Nov. 2. The idea for a new pool and recreation center first emerged as far back as 2015 after the local pool closed. The board has already applied for several grants for the $2 million project. Whitaker hopes it is funded through grants, partnerships, and private donations. They’ve already received support from many individuals including the Clinton County Commissioners. At the community fundraiser, there also will be split-the-pot and T-shirts for sale. To find out how to attend, please contact board member Joyce Kelly at 937-673-0876 or email her at giftedteacher@frontier.com . 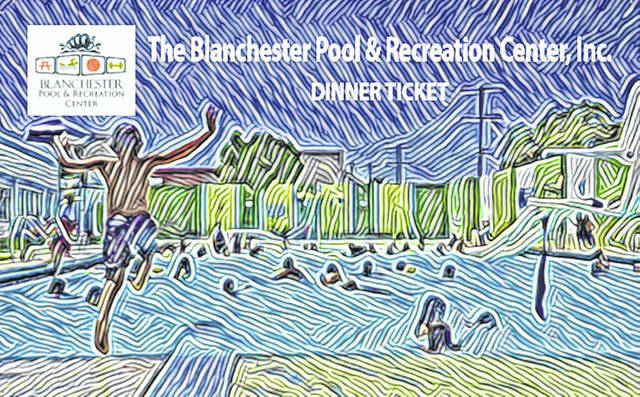 https://www.wnewsj.com/wp-content/uploads/sites/22/2018/10/web1_pool_p-1.jpgA dinner ticket for the fundraiser for the proposed Blanchester Pool & Recreation Center.